The journey from the peak to Kawasan has left our bodies sore and devoid of water. 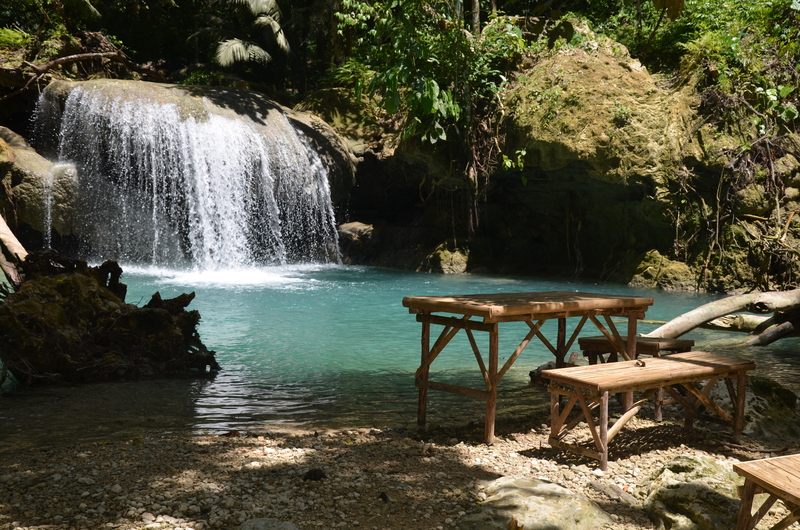 That is why when we reached the falls, relief and ease beamed all our faces upon recognizing the familiar gush of the unsullied waters in Kawasan Falls. We just can’t wait to take a dip and have our bodies soothed by the icy water. Entrance fee to Kawasan Falls is 10php. From the chapel located along the road, we have to walk a kilometer in order to reach the the First Falls. 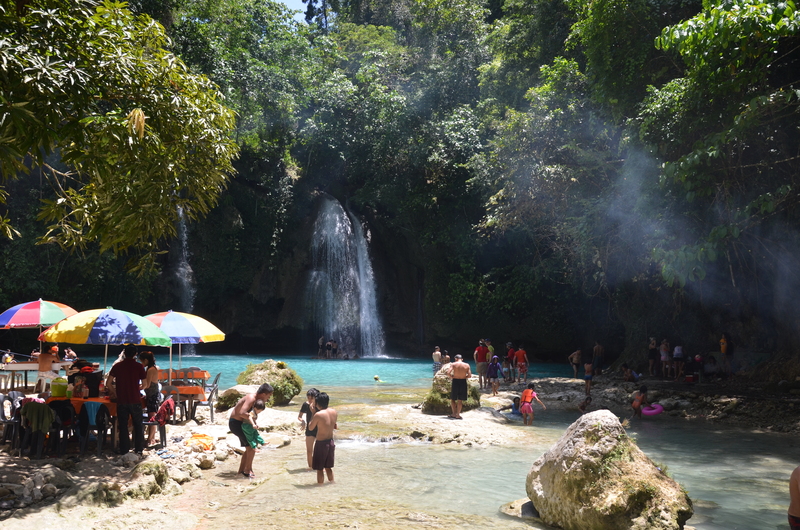 Kawasan Falls has three main falls. Most people call it the first, second and the third (where the source is located) falls. As you go through each main falls, you can also see a number of miniature falls. One of the miniature falls you see along the way. We rented a cottage at the First Falls for 300php. Later we realized, we need not rent a cottage since as what we have observed with other backpackers, they just settled along the ravine and rocks scattered throughout the falls. It was for free! 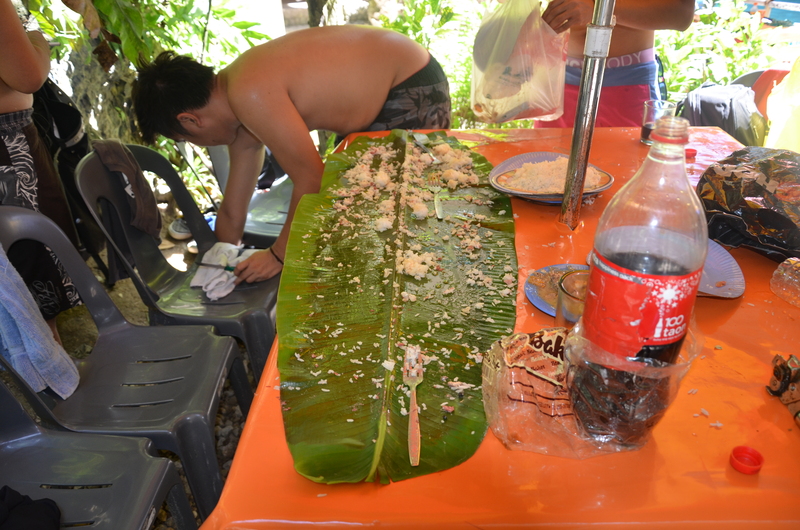 We were ravenous, we needed food, lots of food.haha. 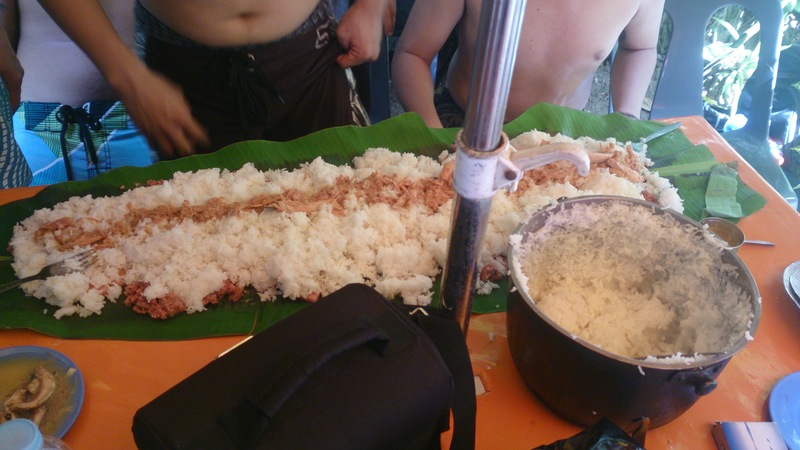 But since we were on a very tight budget, we settled with the remaining tin cans (de lata) and the 2 kilos of rice that we brought.lol To give it a twist, we had a “budol fight” (a Filipino militay tradition wherein soldiers share the food that’s been laid on a banana leaf spread out on a table while eating with your hands ). And we took the much awaited plunge. 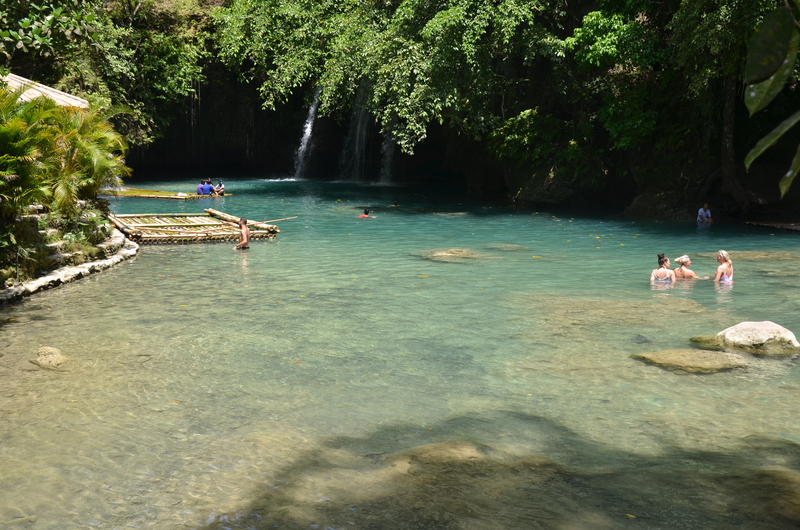 I have been to several springs and falls yet the water in Kawasan is by far the iciest and most soothing of them all. They also offer raft rides for 300php along the course of the falls. 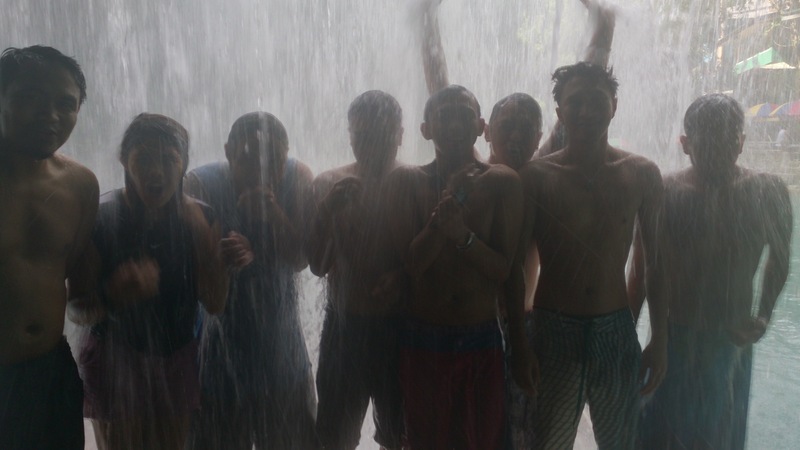 You get to experience the throbbing sensation of the falls as it escalates down your body. It relaxes and at the same time it massages, just exactly what we needed after that trek! We stayed on the raft for quite a long time, not until some group of foreigners with their raft came in. The weariness of our faces gone and replaced with absolute delight. We thought that was the end of our adventure. But there’s more! It started out as a joke actually, we were on waiting for a CERES bus for Cebu when one kidded we go to Moalboal (place famous for its white sand beach just 20 minutes away) and camp there. 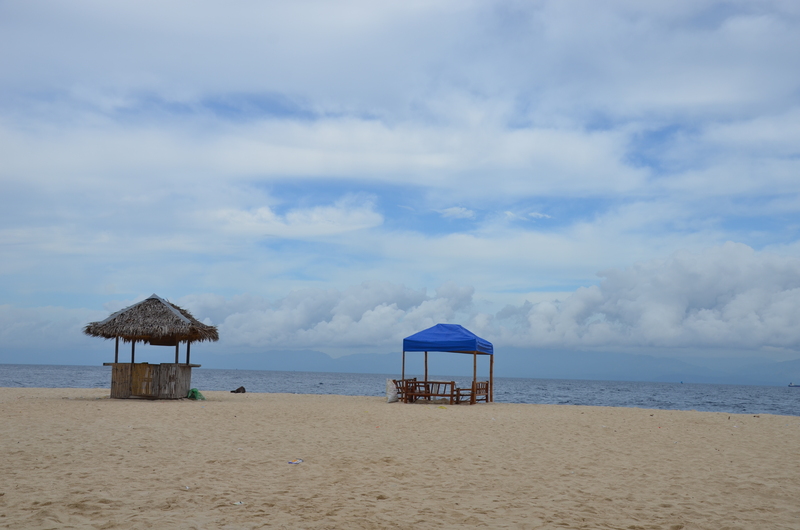 But the joke was second the motioned by another, then another, and just like that, without further adieu we were off to Moalboal!